Aydinli Cave House a boutique, family-run guesthouse set in the heart of picturesque old town Goreme. Aydinli Cave House is totally unique. Carved from the natural rock and stone of Cappadocia, the guesthouse is located just a short stroll from the Goreme village centre. There are six individually-styled rooms that offer comfortable and relaxed accomodation furnished with beautiful, locally-made carpets and family antiques. During restoration of the guesthouse every care was taken to provide modern comforts for guests, while maintaining the orginal structure of the house. This includes rock-cut features of the traditional cave dwellings for which Cappadocia is famous. Terraced areas offer uninterupted views over the Goreme village centre and famous fairy chimneys, the stunning Rose Valley, and beyond, to the snow-capped Aragus Mountain. Aydinli Cave House is a five-minute walk uphill from the town centre within easy reach of the bus station, cafes, restaurants and shops. Come and share our food, our land and, most importantly, our home when you decide to truely experince exotic Turkey. The Yaz Odası or “Summer House” is the smallest of the fourteen rooms. The room was mostly used in the summer time where the Demirci family slept. It is an arched stone room at the entrance of the courtyard, with fairy chimney views. The Yaz Odasi takes full advance of the natural light and has an open, airy feel. Mustafa Demirci was born in this room. Kış Evi or “Winter House” is a large cave room which was once the centre of family activity. This room is on the first level with the Yaz Odasi and has a private courtyard area. The Kış Evi is filled with history. In the winter time the animals were kept in what is now the bathroom. A feature is the low level seating which was where the grapes were once pressed. Local village women would gather in this room to weave carpets and kilms, cook, sew and of course have a gossip. You can still see the original underground oven at your feet. Kış Evi features a large jacuzzi, a fire place, tradtional Turkish bath hamam taps, French bed and an illuminated wheat depot. 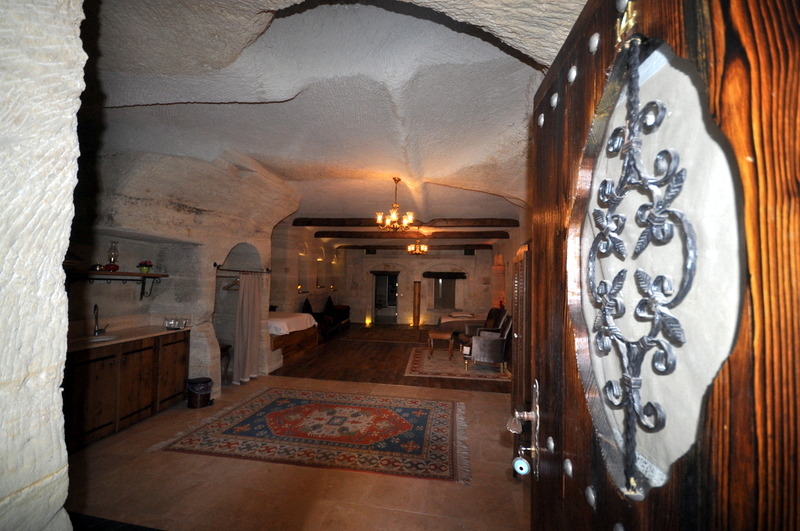 Gazel damı, or “Hayloft”, is a large cave room set on the second floor. Originally it was used for storing animal feed and in later years the front room was converted into a small apartment for Mustafa and his wife, Emine. This room features a lounge area, fire place, French bed and large bathroom with bathtub, shower, and tradtional Turkish bath hamam taps. Guest will enjoy the lovely views over the village. Ambar has a small private court entrace, French bed, shower and bathtub, sitting area and original stone carvings. Sofa, or “Sitting Room” is located on the third floor of Aydinli. It is bulit from a combination of carved rock and stone masonary and was used as a men’s sitting room and storage area for tools and equpiment. The room has a raised bedroom and boasts one of the best vantage points overlooking Cappadocia. This Junior Suite has a sitting area, French bed fire place, and shower and bathtub. This Junior Suite has a sitting area, French bed fire place, and shower and bathtub. Hanedan or ” Family Home” is situated on the same level as Yaz Odasi. Like Yaz Odasi, this room was used mostly in the summer time and during the festive season to celebrate calendar events as Bayram. Hanedan is an arched stone room at the entrance of the courtyard, with fairy chimney views, twin beds, shower and original wall carvings. Şirahane or “wine place” is comprised of two large rooms. The first room, now the living room, was reserved for the Haci Nuri’s eldest son Davut where he resided once married. The second room in the suite was used to squash grapes to produce wine and pekmez (Turkish grape molasses). Kayıt damı or “Food Storage” is located on and was used for storing bread, cheese, grape molasses – carved in the rock, cool and dry. Even temperature. Kayitadami is all carved from cave and features a large bedroom and separate living room, hand carved column, French bed, shower and bath. Çardak or “Bakery (bread cooking)” shares a terrace area with Oceiklik. This part of the house was used in the winter time for preparing main meals. Bread was made in what has now been made into an outdoor sitting area. Çardak features two large caves split over two levels, connected by a small staircase, two bedrooms, French beds, a seating area, shower and bathtub and original wall carvings. Divanhane or “Living Room” is set on the third floor and boasts some of the best vantage points over Rose Valley, Goreme Village and the main mosque. This room was originally used for Pigeon Nests and later used for food storage. 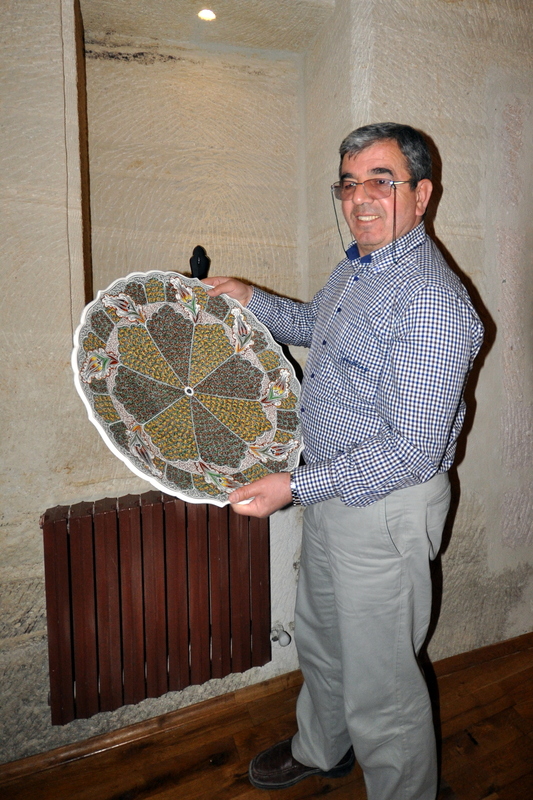 The room is a combination of stone and cave and features a private terrace, French bed, shower and bathtub and original pigeon nest carvings. The samanlık or ‘’Hayloft’’ is the one of our best suite room .The room was mostly used for save the straws.İn ancient times used to meet the needs of the animals in the winter nutrient is the name given to the barracks.In cappadocia, We dont use ’hut’We usually use’cave room and next to stable.’ Because it is important to remain dry.Hayloft is the biggest suit room for our house.you can stay with your family.